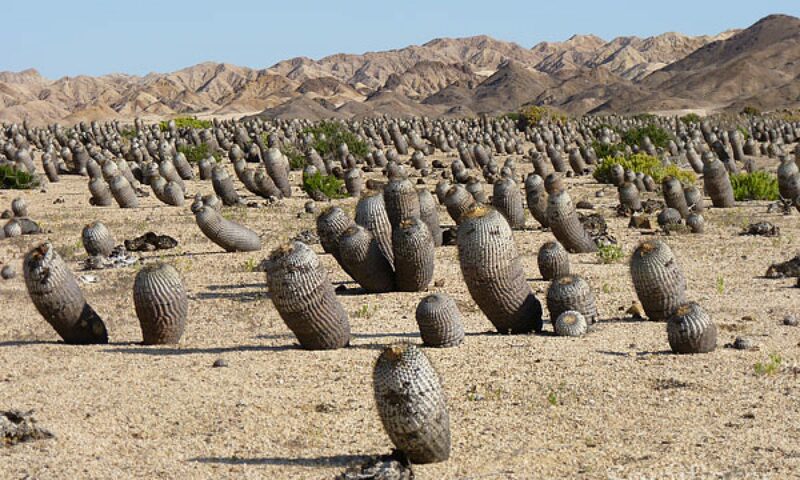 ≪bearing axes≫, in reference to the typical form of axe heads that the tubercles have in the first described species of this genus. A genus of dwarf plants, solitary or caespitose, globose flattened, geophytic living at ground level, not ribbed, with tubercles arranged spirally, with spindle-shaped root; areoles rudimentary, dimorphic, producing spines on the outer part and the flowers at the base of tubercles. Tiny spines, numerous in P. aselliformis (up to 60), more or less pectinate. Flowers diurnal, self-sterile, funnel-shaped to bell-shaped, appearing at the base of tubercles near the apex, pericarpel naked, pink, purple to magenta, exceptionally white, pollinated by insects. Fruits dried when ripe, soon disintegrating. Seeds small, cochleariform (spoon-shaped) brown, matt, striate. 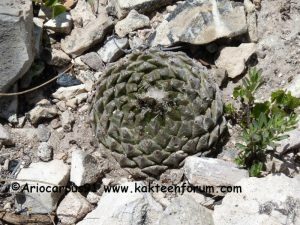 The genus Pelecyphora grows at ground level, almost completely buried, on limestone rocky hills, in gravel, mimetic, cryptic, hidden in stones among the surrounding vegetation, between 1600 m and 2200 m in altitude. Mexico (Nuevo Leon, San Luis Potosi, Tamaulipas).